Facilitation of events, workshops and meetings has always been at the core of our work. And we've been lucky over the years to work with a group of very skilled and fun friends and colleagues, many of whom connect through the KM4Dev network. With them and others we've tried in different ways to share that experience, running training sessions and co-facilitating with people interested in building their skills as facilitators, especially in the area of knowledge sharing KS) and collaboration. For example, during the ICCO Communication with Partners programme that ran from 2007 - 2012, we recruited, trained and learned with an international group of 'enablers', people who could support and work with ICCO offices and partners, in using digital media for KS. Our Compart Enablers workshops included a lot of training in face-to-face and online facilitation. 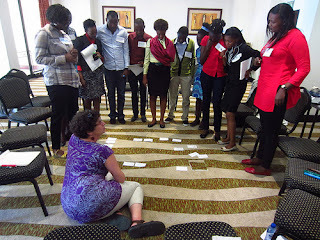 During that period, at the 2010 AgKnowledge Africa ShareFair we ran a 'Day 0' training day for participants, which included a set of sessions on face-to-face KS approaches, all of which require people to take a facilitator role. ‘AgKnowledge Innovation' Process Share Fair' in 2015. With a wonderfully diverse band of facilitators and a group of experienced Agricultural Research and Development specialists we experimented with and learning about different approaches to Facilitation face-to-face, online and where there is a 'blend' of online and in-situ participants. Pier Andrea has reflected on the experience in this blog, and we have stored recordings from the online and blended sessions. Pete is working with Isobel McConnan to develop a structured training programme in Facilitation, including in online and blended events. The course is designed for people with some experience of facilitation. Pete and Isobel will be blogging as they prepare and deliver the programme, and we'll be linking to those blogs from this site.